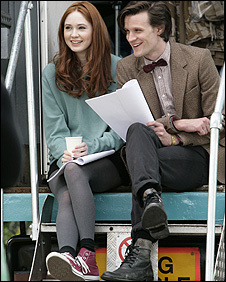 Today Matt Smith and Karen Gillan begin their Doctor Who career proper – they have started filming. Today we have, finally, discovered Karen’s character name and see the eleventh Doctor’s outfit. It all feels a little bit leaked. Was it a controlled leak? We may never know but it certainly wasn’t the big glossy publicity shot of the two of them I was expecting. Instead of the big headline (Doctor Who Magazine covering) shot we get a rather more intimate, behind the scenes sort of picture. They two of them look relaxed and happy. They look natural rather than artificial and posed. Perhaps that was the point, if there was one. They look at home both together and on the set. No first day nerves for these two? Probably a twinge but there is no sign of it here. We do know they’ve been in Cardiff for a few days. A couple of days ago, or so, some lucky fan came upon the two of them wandering around what looked like Cardiff Bay and got their photo taken with the two of them. A picture that quickly did the Twitter rounds before been removed from the originating website. So clearly Matt and Karen didn’t just meet this morning. No doubt they met up for dinner a couple of months ago, too – I know I would in their situation. But lets get onto the meat of today’s revelations. I have to admit to being a little disappointed that Steven Moffatt (the Vast Toffee (MN)) didn’t go with my choice of companion character name – Grunhilda Knobnacker. Instead he opted for ‘Amy Pond’. Okay, perhaps Karen does look more like an Amy than a Grunhilda (assuming such name/appearance correlations are valid at all!) I’ll forgive the Vast Toffee, this time! I do wonder why there was all that secrecy about the character name up until now, though. It’s not a name that means anything to anyone (so far as I can tell, anyway). Nor did they break the silence in a big shower of publicity. It just kind of leaked out a couple of days ago and was confirmed in a ‘by the way’ fashion today, to go alongside the news of Matt Smith’s costume. That leaves me utterly baffled as to why they didn’t release the name Amy Pond when they announced Karen Gillan’s appointment. Confound that Vast Toffee and his unfathomable ways! 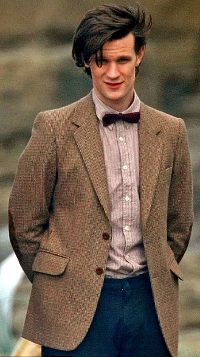 The real news, though, appears to be Matt Smith’s tweed jacket, complete with elbow patches, and bow tie. A somewhat professortorial look for Doctor 11, then. With rolled up trousers and combat boots! He’s a man ready for action, either down in the trenches or in the library – a man for all seasons! I have to say, I do quite like Matt Smith’s costume. It doesn’t immediately appeal to me as much as David Tennant’s costume (perhaps because Tennant’s costume is a little bit more like I wear myself!) Nonetheless, I do rather like Matt’s outfit. They’ve gone for a look that I (and probably most brits) associate with the Open University and old school science teachers. It takes the edge off his young appearance. Makes him seem a little more timeless. Job done there, then. A quick poll of people around the firm seemed to give tentative thumbs up, although one person was concerned that he looked exactly like ‘Pee-wee Herman’. I don’t know how well that character is known in the UK – I’ve heard the name referred to in US films and TV but don’t really know who he is. I don’t think the 1950s/60s American High School ‘Poindexter’ look means much on this side of the pond – that’s certainly not what I see in his costume, as I said he looks like an old school professor to me. I do wonder if Amy will start calling the Doctor ‘Professor’! I’m not quite so sure what to make of Karen/Amy’s outfit. For one thing, it is probably more likely to change as time goes by, as Rose’s did (more so than, say, Martha’s). Has she stolen Tennant’s shoes, though? I know she’s tall but I doubt they’d fit her! To be honest, I preferred her outfit from the publicity shots they did for the announcement of Karen Gillan’s appointment. Maybe we will yet see something more like that – who knows what might be under that baggy pullover of hers! To sum all that waffle up – I’m happy with the 11th Doctor’s costume. I like the new companion’s name (even if it wasn’t the silly name I came up with!) I am really encouraged that they look so relaxed on set on their first morning of filming. I am a bit disappointed these new facts weren’t released as some big publicity drive with cool looking promo photos but these more informal shots have given me real confidence that Karen and Matt are going to be a great duo. Good luck to both Karen Gillan and Matt Smith – enjoy it, make it the time of your lives. 00:49 — Welcome (with celebratory cake)! 08:23 — Heroes: Is Claire going to bat for the other team? 09:39 — View-Master: The Movie coming? 13:00 — Hong Kong Phooey: The Movie! 14:38 – Doctor Who: Favourite and Least Favourite Bits. 28:37 – Fight Club: Original Captain Kirk vs. New Captain Kirk. 33:19 — Intro and theme tune. 34:24 ——- Doctor Who: New spin-off series confirmed. 35:46 ——- William Shatner: compromise on where his body will be displayed. 37:22 — Doctor Who: Revenge of the Nimon, part 1. 51:34 – Swanee-Kazoo: Guess the Theme Tune. 59:35 — End theme, disclaimer, copyright, etc. 60:19 — Outtakes and a couple of interloping interlopers! Are David Tennant’s ‘Special Doctor Who Projects’ undermining Matt Smith? We must be mere days away from Matt Smith beginning his tenure as the Doctor by filming his first scenes. David Tennant has already filmed his last scene as the Doctor for the series proper (future guest appearances aside, such as in 2013). So, it’s all Matt Smith’s now? He IS the Doctor? No, it doesn’t look like it’s going to be that simple for him. In stark contrast to his predecessor, one Christopher Eccleston, David Tennant seems to be clinging on for all he’s worth! No sooner than the likes of Russell T Davies are talking about Tennant filming his last scene, than they are talking about Tennant being back as the Doctor in The Sarah Jane Adventures. Then he’s back again for a seven part animated story. Then RTD adds: “… it would be nice to round things off with a Special Project 3… I can promise, it’s worth waiting for!” I can’t but begin to wonder – has David Tennant really quit the role at all?! Right now we don’t know what the special third project is, rumours of a big screen film adaptation aside. Whatever it is, though, we do now, effectively, have two Doctors running concurrently. Special projects one and two (the Sarah Jane Adventures and the animated stories) are designed to fill the gap of Doctor Who on our screens this year – they will air before Tennant’s official final scene, even if they weren’t recorded in that order. As for this third project – we just cannot say for now, it is likely that it too is designed to fill the gap before Matt Smith’s on-screen début as the eleventh Doctor. No problem then. A bit of concurrent recording can’t possibly cause Matt Smith any problems. On the face of it, no. Except I can’t help but think if I were in Smith’s shoes I might be getting a bit concerned that the wildly popular chap I’m supposed to be replacing is still doing my job! Perhaps Matt Smith isn’t nearly as insecure as I might be – almost certainly not. Nonetheless, you don’t want your predecessor breathing down your neck when you are trying to make the role your own. I am, undoubtedly, overplaying this rather – at least I hope I am! If those rumours of a major Doctor Who feature film turn out to be true and it isn’t Matt Smith on the big screen (especially if it is, instead, David Tennant) then perhaps I am not overplaying it at all. Any such film won’t be out until long into Smith’s tenure as the Doctor. The whole film theory is probably unlikely though, isn’t it..? Before I leave you to your thoughts on this, I would like to point out that I am a great fan of what David Tennant has brought to the series. His has got to be the most popular Doctor since Tom Baker’s. David (breaking into first name terms even though I’ve never met him but it feels like I have) genuinely seems to be a great chap – a really down to earth guy who I think would fit in perfectly amongst my group of friends. He’d be great on the podcast! I don’t for a second think he’d ever do anything personally to undermine Matt Smith, quite the reverse. Nor do I think that Matt Smith isn’t capable of taking the role and making it his own, no matter what else might be happening elsewhere. No, I didn’t want to see David Tennant leave the series but, now that he has, I am very keen to move on and welcome Matt Smith. Perhaps it isn’t Matt Smith that these David Tennant ‘Special Doctor Who Projects’ are undermining but my own sense of closure. I felt a tinge of sadness at the announcement that Tennant had filmed his last scene. Maybe I needed a bit of time to mourn, even. Now it almost feels like David Tennant is playing ‘cry wolf’. Will the big bad wolf of David Tennant truly leaving the role ever come? 02:03 — Torchwood: Children of Earth UK airdates. 03:16 — Sarah Jane Adventures: Nigel Havers and Brian Miller cast. 04:33 — Heroes: Bryan Fuller quits (again). 05:22 — Indiana Jones: more fifth film talk. 08:40 — Farrah Fawcett has died. 09:41 — New Doctor Who Roleplaying Game isn’t dead, after all. 11:15 — Tron: more new film details. 12:17 – Doctor Who: Daleks (in general). 44:23 – Benjamin Elliott’s 30 Second Recommendation: Legend. 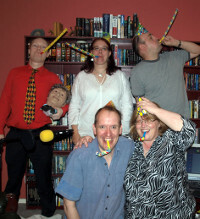 67:59 – Farewell for this podcast! 68:23 — End theme, disclaimer, copyright, etc. Cubicle 7 (Doctor Who: Adventures in Time and Space RPG). 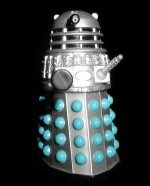 YouTube: Kit Kat advert with Daleks. Firestep, the animators behind The Infinite Quest. It was a brave move by 2|Entertain/BBC Worldwide to release this incomplete Patrick Troughton story on DVD. The problem they are facing is that only 6 of the 21 Patrick Troughton stories are complete in the archives, the other 15 are missing at least one episode. 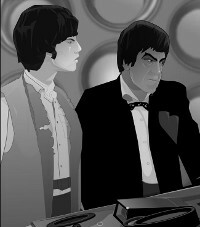 As I write this only two complete second Doctor stories are left to be released. Their solution to this big problem was to hire Cosgrove Hall (famous TV animators behind the likes of Danger Mouse and Count Duckula) to recreate the two missing episodes, with hopes to do the same to other such stories. Apparently The Invasion DVD didn’t sell that well, though, so plans for any more animated recreations are sadly on hold. Or are they? Rumours abound of the same being done for Power of the Daleks but that has zero surviving episodes, so I have my doubts. Before I continue, I should say that I am writing this before we recorded Staggering Stories Podcast 48, where we discuss this story (or will!) This is, in part, my way of gathering my thoughts before we talk about it. It will also, I hope, expand upon that podcast slightly. The obvious place to start is with the length of the story. The Invasion is eight 25 minute episodes long. The average (mode) is 4 episodes per Doctor Who story, so clearly this was twice as long as most stories. It doesn’t drag as badly as you may think but there is quite a gap before we see the alien villains of the piece, at the end of episode four. There’s a lot of messing around with our heroes gaining access to the human villain’s lair (more than once!) Fortunately some great characterisations keep it enjoyable. It’s a Cyberman story, let’s not try to hide that fact. There aren’t in it very much and we certainly don’t get any kind of face off between them and the Doctor. Instead we find the familiar (particularly in later third Doctor, Jon Pertwee, stories) concept of a power mad human using an alien invasion force to personally rule the world! The obvious benefit of this is that you have the Doctor battling someone that can emote (snear, mainly!) In this case we are presented with the evil Tobias Vaughn, played brilliantly by Kevin Stoney. Vaughn is so perfectly archetypal that he wouldn’t look out of place in a James Bond film. He’s an electronics mogal, a bit like a less evil version of Alan Sugar, who has somehow (rather glossed over) made contact with the Cyberman fleet in deep space and ‘done a deal’. Vaughn gets a leg up on his competition with electronics technology donated by his allies and within five years has cornered the market. You can see that Stoney is enjoying the part, especially on those many occasions where he says “Packer…” (during the commentary many of them, notably Nick Courtney and Fraser Hines, do their impressions of Stoney saying ‘Packer’!) Like most evil genius villains he doesn’t really get to leave his lair, at least not until the very end and I don’t think he makes it off the grounds! That’s a shame as it means he has little interaction with most of the cast. If this were the Pertwee years you could be sure that the Brigadier would get to storm into his office and then have to slope off after getting a warning from some top ranking politician under the villain’s thumb! That brings us neatly onto Tobias Vaughn’s human associates. The most notable of these is, of course, Packer. A sadistic thug who has the brains of a turnip. At first I couldn’t figure out why Vaughn would want such an incompetent as his closest ally. Then I realised that his lack of intellect was exactly the point – such villains as Vaughn often make the mistake of trusting someone too ambitious, someone who will inevitably stab them in the back to take over themselves. Packer would never dream of doing anything like that – he knows he couldn’t replace Vaughn. Packer’s loyalty reminds me of a hunting dog, waiting patiently (for the most part) for his master to unleash him on some unfortunate little animal that he then enjoys tearing apart. In the end, though, Packer’s incompetence in capturing the Doctor indirectly leads to Vaughn’s downfall. Other characters in Vaughn’s employ appear to be few and far between. He has at least two large complexes, one in the country and another, a skyscraper, in central London. Odd then that the only other employees we see are Packer’s security men (again in true Bond style) and a couple of scientist types. Are these buildings otherwise empty?! I’ve mentioned the Pertwee era a few times already and that’s no coincidence. This is a prototype Pertwee story, plain and simple. The United Nations Intelligence Taskforce (UNIT) is first introduced and Alistair Lethbridge-Stewart makes his second appearance in the series, this time promoted to his famous rank of Brigadier. I haven’t seen ‘The Web of Fear’ (Lethbridge-Stewart’s first appearance) but by ‘The Invasion’ he seems to be the fully formed Brig who becomes a regular in the next season with Jon Pertwee – crappy stick on moustache and all! The only other really important guest characters are Professor Watkins and his daughter Isobel. Watkins has been kidnapped by Vaughn because he had a device that might give Vaughn power over the Cybermen. Isobel is, effectively, a third companion – there mainly to give Zoe someone to get into trouble with while the Doctor pairs up with Jamie. Let’s get into the nuts and bolts of it, though. This story is echoed by many later Cyberman stories. Let’s start with the brain washing. At first it is key people, government types it would seem. At the end of the story that is extended to the entire human population of Earth via a special circuit put into all of International Electromatics products (IE being Vaughn’s company). Very much like the earpods in the New Who, alternate Earth, Cyberman creation story ‘Rise of the Cybermen’. Then there are the sewers. This is more like a call back to ‘The Web of Fear’ where the Yeti were also roaming around under London (in that case in the London Underground metro system rather than sewers). Once they’ve had a taste for the London sewers the Cybermen can’t seem to get enough, though – in Colin Baker’s ‘Attack of the Cybermen’, full of historic Who references, the Cybermen travel back in time so they can frolic in the sewers once again! Then we have some pretty blatant cast holidays. For an episode Zoe (and her story companion Isobel) are kidnapped and don’t appear in an episode. Then we have Jamie unexpectedly shot (just a flesh wound, we are told) and missing from the final episode as he recuperates. Zoe’s absence was so well written into the script that you hardly notice it is exactly one week she is gone for. Jamie’s is rather less well done – he’s shot. You’d think that would be a major plot point, something they’d play up for dramatic effect. They don’t – it goes hardly remarked, just enough to say he was only very lightly injured. At least in the final, pre-recorded location scenes, they did have the foresight to give Jamie a bandaged leg but I didn’t get the impression they’d really given it enough thought! Another thing I thought was a little odd, poorly plotted even, was all that stuff in the first episode. Namely the IE colony and the general ‘1984’ air to it that disappear in subsequent episodes. International Electromatics go from being a sinister cult who controls a sizeable part of the country to a man in an office with some security thugs, albeit a sinister man in an office! Another interesting but rather glossed over element is the partial cyber-conversion that some IE personnel have apparently undergone. The first evidence of this are the super strong workmen who are shifting the inert cybermen (in their boxes) around. Next was Vaughn’s laughing immunity to bullets. I can just about imagine Vaughn agreeing, even being eager, to be ‘upgraded’ – so long as his mind is left unaltered. He’d want the results – the physical superiority to match his intellectual superiority. I’m less convinced he would trust the Cybermen enough to let them actually carry out the, no doubt, extensive surgery. How could he have been sure he would have woken up without any alterations to his brain? Perhaps he had some kind of insurance, a hold over them stronger than their merely needing his company, IE. Sadly such details are glossed over, especially considering the story is over 3 hours long! All these criticisms aside, it really is a good, fun story. Patrick Troughton is a great Doctor and his teaming up with Frazer Hines’s Jamie really did produce one of the best Doctor/companion pairings of the entire series. Wendy Padbury’s Zoe is by no means bad but she just can’t match the chemistry between Patrick and Frazer. There are a lot of really good performances and characters, as previously mentioned. That’s the real strength of this story – it’s not the slightly hackneyed plot and certainly not the deus ex machina resolution (would the Cybermen really be vulnerable to that?!). No, watch this story to enjoy the characters.